“Cook Momma?” Her voice reaches me as I empty the last of the Fiestaware from the bottom dishwasher rack. “Work. No. Momma- cook.” She stands her tiny ground that she needs attention. Now. In the last few months her ability to tell us what she means has become clearer. It still requires patience and prompting. But it is clearer. 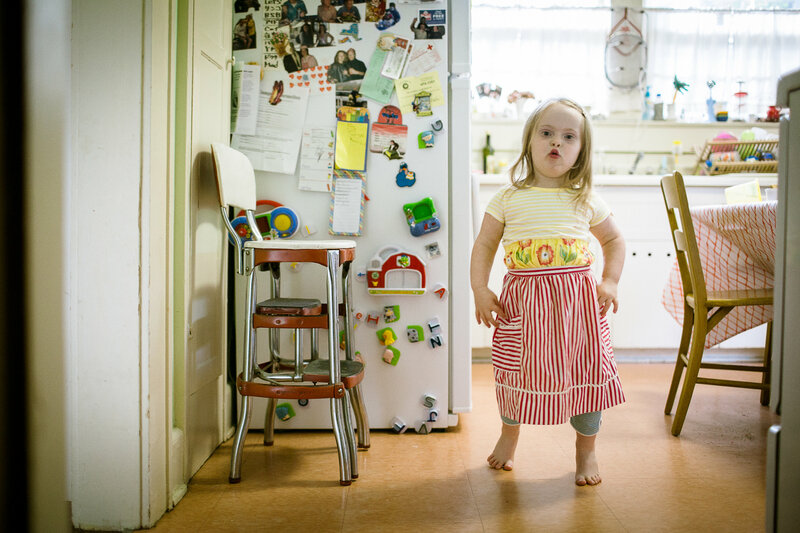 She turns and runs to the pantry grabbing one of the set of pint-sized aprons we keep on hand for cooking. She hands it back up to me and turns her back waiting, knowing that I will tie it in a gentle bow and acquiesce to her request. I lean down and kiss her strawberry locks and hand over the rainbow whisk that she loves to “cook” with. There may not be time to make actual muffins. But certainly there is time for the even better make-believe ones. Because I can see it. I can see her mind and many of its facets so much more clearly now than I could a few short years ago. I can see when she is pretending and when she is serious. When she is ready to learn and when she is ready to teach. When she is ready to work and when she is ready to play. I turn back to the dishwasher to finish emptying the top rack as she starts lining up the metal bowls from the bottom of the baker’s rack with a pattern of clanks onto the hardwood floor. As she whisks her thoughts into something tangible for the rest of us to see, her sister’s come in to the pantry to join her. Together they mix and stack and stir and blend their lives, their time, their make believe and their reality.